1. Prepare Tzaziki Sauce: Combine all sauce ingredients in a bowl and mix well. Cover and refrigerate for 1 hour. 2. Preheat gas grill to medium high. 3. To make grilled eggplant, combine vinegar, oregano, salt and pepper in a small bowl and then whisk in the olive oil until the mixture is thick and well-blended. Arrange the eggplant slices in a 9x13-inch baking dish. Pour dressing over slices and turn the eggplant to coat well. Set aside. 4. To make patties, combine lamb, mint, and cumin in a large bowl and season with salt and pepper. Handling the meat as little as possible to avoid compacting it, mix well. Divide the mixture into 6 equal portions and form the portions into patties to fit the pita breads. 5. When the grill is ready, brush grill rack with vegetable oil. Place patties on rack, cover, and cook, turning once, just until done, about 4 minutes on each side for medium-rare. 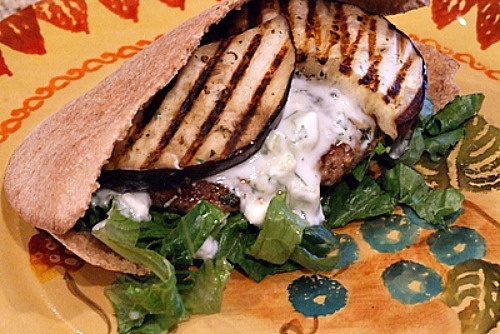 Grill eggplant slices until tender, about 3 minutes on each side. During the last few minutes of cooking, place the pita breads, cut side down, on the outer edges of the rack to toast lightly. 6. 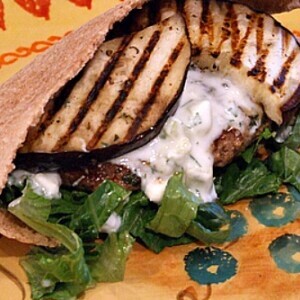 To assemble the burgers, on each bread bottom, place 1/2 cup lettuce, a patty, an equal portion of tzaziki, and an eggplant slice. Add the bread tops and serve. *If you are serving this as gluten-free, serve on GF bun or bread, or serve without a bun.